More bad news on civilian casualties in Iraq and Syria. An Iraqi boy looks on as people collect wood and metal at a site that was targeted by an airstrike a couple of days ago, in Qayyarah, south of Mosul, on Oct. 29. Several recent reports underline the growing risk to civilians in the U.S.-led war against ISIS in Iraq and Syria. 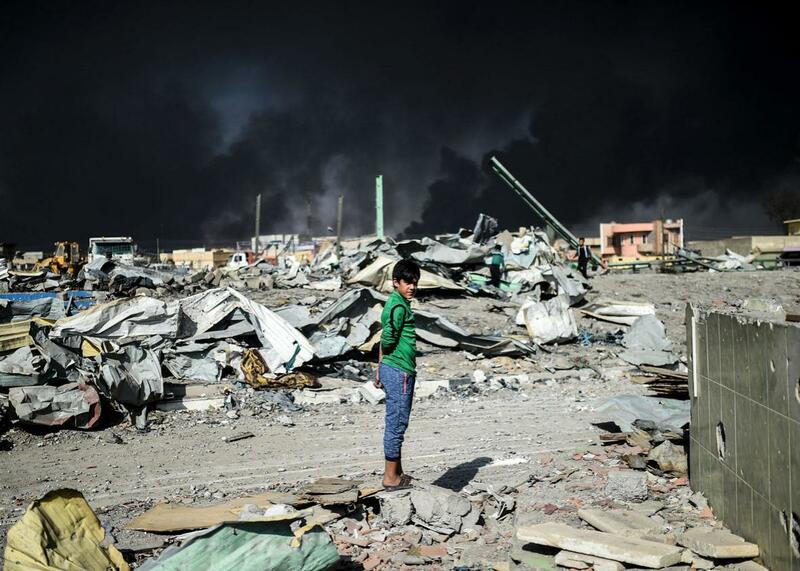 On Thursday, the Pentagon released the results of an investigation, finding that more than 100 civilians were killed when the U.S. dropped a bomb on a building in Mosul, Iraq, in March, the largest single incident of civilian deaths since the campaign began in 2014. (Locals have put the number at around 200.) CentCom had initially denied that the strike took place, before announcing the investigation. Officials now say that ISIS had likely placed explosives inside the building, contributing to the deadliness after the bomb was dropped. The battle for Mosul, which has gone on for more than seven months now, has been particularly brutal for civilians, who have often been prevented from leaving by ISIS or advised not to by the Iraqi government. Meanwhile, a fresh wave of airstrikes by the U.S.-led coalition reportedly killed dozens of civilians, including children, in Eastern Syria this week. The London-based Syrian Observatory for Human Rights reports that “106 people have been killed in Mayadeen since Thursday evening, including IS fighters and 42 children.” Eighty of those were killed in an airstrike on a building that housed the families of ISIS fighters. Syria’s state news agency put the number at 35, and the coalition has not yet responded to the report. Journalist Samuel Oakford of the monitoring site Airwars also published an investigation in cooperation with Foreign Policy today finding that non-U.S. members of the anti-ISIS coalition have killed at least 80 civilians in Iraq and Syria since the start of the campaign, but that none of those 12 countries will acknowledge responsibility for any of the deaths. Airwars also reported this week that between 283 and 366 civilians likely died from coalition airstrikes in Iraq and Syria in April, the fourth consecutive month that those deaths exceeded those caused by Russian strikes. This has raised questions about whether the Trump administration’s hands-off attitude toward airstrikes has raised the risk for civilians. The UN’s High Commissioner for Human Rights today warned that civilians are increasingly victimized by both the intensified airstrikes, and the retaliatory attacks by ISIS. In once incident, ISIS fighters slit the throats of eight men in a town that had just been bombed, blaming them for giving away coordinates to the coalition. The situation is only likely to worsen as the battle for Mosul grinds on and the campaign against ISIS’s heavily fortified capital in Raqqa ramps up.